With the temps dropping, it’s time for me to invest in a few new winter workout pieces! I have so many warm weather workout clothes (I do live in Texas, after all), but somehow my cold-weather workout wardrobe is lacking. Specifically, I need some full-length jogging leggings and a solid jacket. I think it’s time for me to retire my old Theta fleece, don’t you? For pants, I’m intrigued by this high-waisted pair and this style too. For jackets, I love how the sleeves are fully reflective (great for early morning jogs!) on this one, but this style looks a little heavier, therefore warmer. I’d also really love to pick up an ear warmer for those super chilly mornings. This week I need to stop by Luke’s Locker to pick up a new pair of sneakers – you’re supposed to replace them every 3-6 months and it’s been over a year!! I have my eye on this pair in fiery coral – Brooks makes the best running shoes! I know it’s not even Thanksgiving yet, but when Pottery Barn has a sale, I can’t help but share! Enjoy 20% off + free shipping on all stockings and tree skirts until tomorrow! Now’s the time to stock up your Christmas decor. My favorites are these woodland stockings and these embroidered stockings. For a glam tree this season, try this faux sheepskin tree skirt with white lights and glittering garland! Also, don’t forget to check out their unbeatable selection of ornaments. Enjoy 25% off winter wear at ASOS until the 7th! A few pieces worth a look include this punchy orange-red moto jacket, this buffalo check dress and this bottle green leather midi skirt. They also have some great winter accessories marked down – my bets are on this faux fur collar and this scarf. Click here to shop all the marked down goodness! I need some cold weather workout clothes too,it gets really windy in SFL. Loving #12. THAT SKIRT!!! I need it! Great picks Merritt! I love it all! My favorite color palette! Theta Love Merritt! Obsessed with that purse (5)! Love the whole spread as always! I adore that skirt, the pattern and shape, SO pretty! That skirt would be so perfect for Thanksgiving dinner with a black turtleneck and some OTK boots!! Its GORG!! Happy Tuesday Merritt! 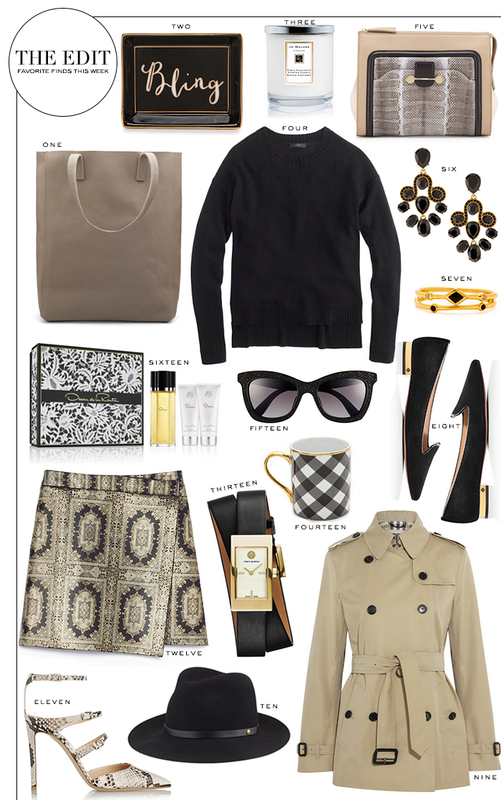 Love the C-wonder bling dish, and you can never go wrong with a Burberry Trench coat! Such great picks! K, I NEED these sunglasses! Cute picks as always! So many amazing choices! I love the Burberry trench and that snakeskin clutch. That skirt is so cool! Ugh, ASOS is killing my wallet lately! Love this edit, Merritt! Number 8!! Those shoes are amazing! Obsessed with the clutch and those heels! Always love good texture and prints! I love it all! The trench is such a classic. And those black and gold flats are so fantastic. Amazing picks! Those shoes!! I really have been obsessed with those Gianvito Rossi strappy shoes forever. I can totally see you pulling them off! Love these! The heels and the mug!